Generally, you don’t have mileage running deals anymore, especially with less than 100% redeemable mile earnings, revenue based earning, and higher fares. However, I booked the best airfare deal of the year just a month ago, when British Airways had an incredible fare sale on flights to Europe. 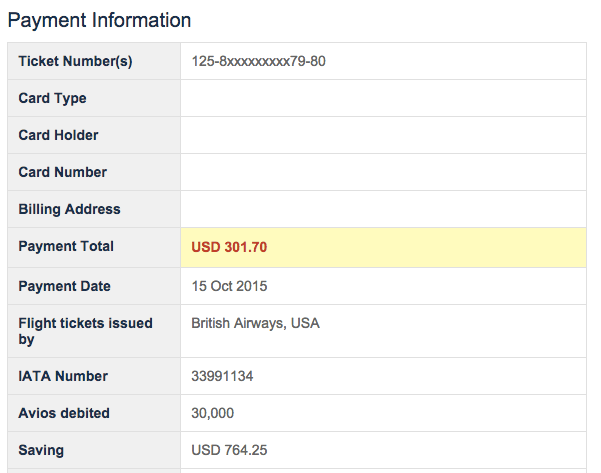 Flights to London were advertised at $2015, but the actual price was even lower, at around $1800. However, as the day progressed, people discovered that it was working for continental Europe, allowing you to save on APD, which was roughly $220. The base fare was $476. However, what was even more amazing was that you could stack another discount on these fares. As an AARP member you can take $400 off on a business class fare, applicable to all J-class fare buckets. This let you lower the base fare to $76, with an all-in price of $1035. 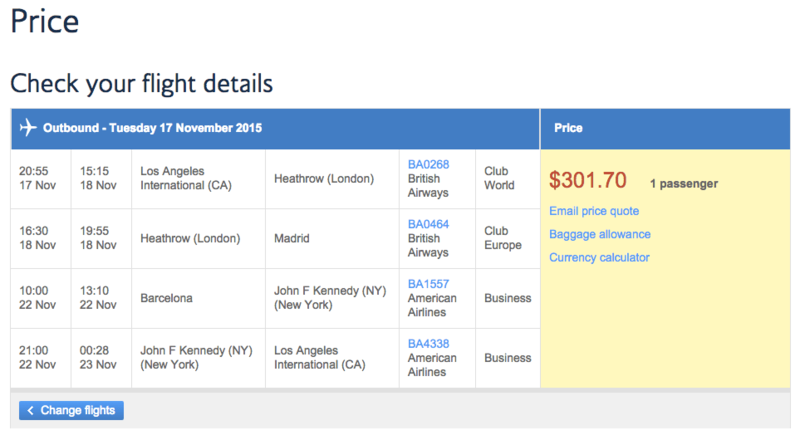 At that price, it already is a incredible deal for transatlantic business class fares, given that surcharges and taxes when flying British Airways on an award ticket is $800-900 in business class. The final kicker when booking the fare, however, was that you could stack another promotion on it, which was using Avios to decrease the price of the ticket. Normally, this was only supposed to be used for fares to/from London and on British Airways metal only, but it was working on this fare. With 30,000 Avios, you could take off $764. This meant you got a redemption value of 2.5 cents on your Avios. 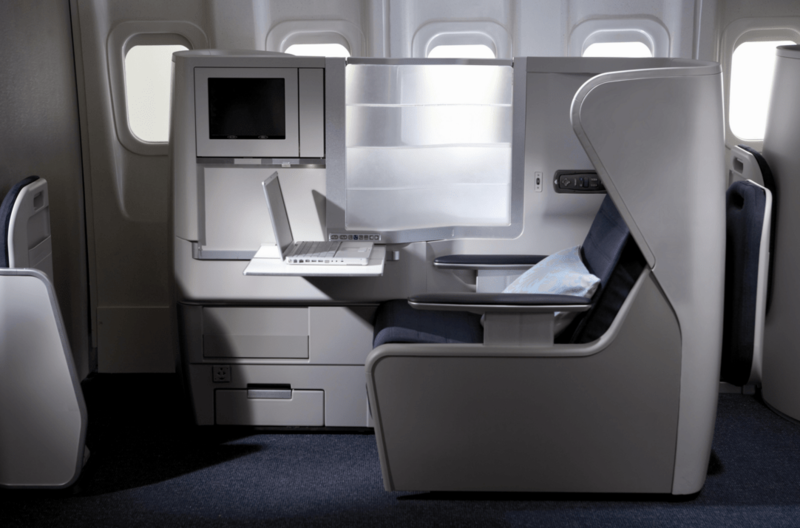 You can get these Avios when signing up for the American Express Gold Card or Business Gold Rewards Card, offering 25,000 and 40,000 points in signup bonuses, respectively. This resulted in my fare being only $301, and 30,000 Avios! In ticketing I managed to get the return on American’s new 767 with staggered business class seats, and put in an open jaw between Madrid and Barcelona. 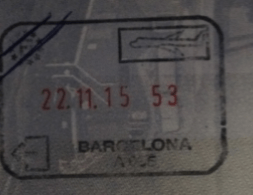 It was issued on British Airways ticket stock (starting in 125). This is relevant because it meant that you couldn’t apply a systemwide upgrade on the fare (although irrelevant in this case), and it wouldn’t be applicable for a promotion on tickets which had to be issued and operated by American. But even at booking, this was a fantastic deal. The first half of the trip went well. A friend decided to join me on this trip, and we flew Los Angeles – London – Madrid together. Club World was mediocre, although the A380 was nice. I would rank the seat itself as pretty much below any flat-bed business class product, while service and soft product were average. For $150 though, it was perfectly reasonable. Our flight landed delayed into London, meaning we had an agent greet us at the gate and sprint through Terminal 5 from concourse C to A by foot in 25 minutes, having to clear European transfer security as well. For those of you who’ve transited through London, you’ll know how delightfully fun that is. Luckily, we made the flight, and all was well. On the return, things got a bit crazy. At the gate area, the boarding agents announced that our flight had been cancelled. This was actually the first time this year a flight had been cancelled on me, so it was totally surreal watching the surprise and shock from all the passengers in the gate area as everyone heard the announcement. Since everyone had already cleared Schengen exit immigration, we had to go back through immigration, which was severely understaffed. I had my exit stamp crossed off. The line for rebooking was around 20 deep at this time at ticketing in the departure concourse, so I was doing what I always recommend when IRROPS occurs. Look at availability online (or ask friends to help you), and call the elite/rebooking line via Skype. I was on hold with AA while waiting in line, and managed to get rebooked even though American hadn’t cancelled the flight officially in their system (it ended up actually leaving 3 hours and 40 minutes late, strangely enough). My routing back to LA ended up being Barcelona – London Heathrow – New York JFK – Los Angeles. The best part about this was that it was issued back on American (001) ticket stock, and in a flexible fare class (J/D). As luck had it, I had to make another 35 minute connection in Heathrow, although I did make my flights and actually ended up landing an hour early in LAX compared to my original itinerary (although my long layover in New York got scrapped). However, this also stacked with two additional promotions. The first was the Trans-Atlantic Bonus, giving a bonus of 25,000 miles for each round-trip in business class across the Atlantic. Finally, I also got to earn miles from American’s Bonus Miles promotion for flights marketed and issued on American ticket stock. The IRROPS was especially helpful here, as my return thus become eligible for this promotion. I earned 12,000 miles each on the LHR-JFK and JFK-LAX legs, and 1,000 miles for the MAD-LHR leg. This meant I earned a total of 80,619 redeemable miles on this trip, enough for a First Class one-way ticket to Asia. Even at a conservative valuation of 1.5 cents, that’s $1200 in value back in miles. 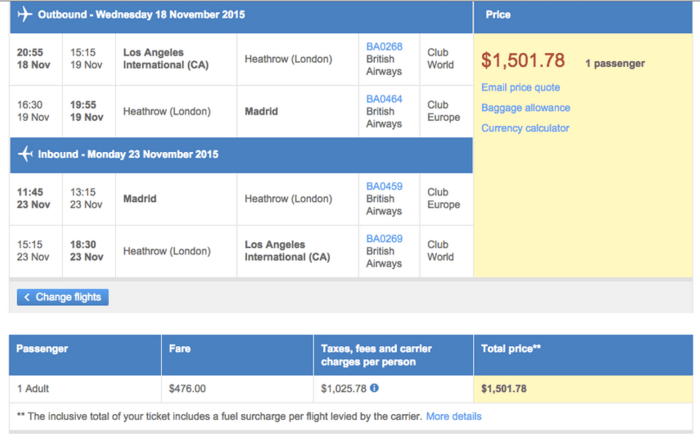 For $301, this was an incredible deal for a trip to Europe, even without the miles! What’s the best airfare deal you’ve ever had? I am a new reader, but I notice that your flights often begin in LAX, you are an AARP member and other US designations. Do you live in the US? Or do you fly down to the US to get your flights from Vancouver or do you have a fake address with a relative to get these perks.